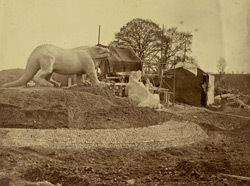 Concrete reproductions of prehistoric dinosaurs are installed in the grounds of Crystal Palace in Sydenham. British sculptor Benjamin Waterhouse Hawkins teamed up with Richard Owen to create these lifesize replicas. They became a prime attraction at the Crystal Palace Exhibition of 1853-54, an event which heralded British industrial ingenuity and power, and marked the founding of the World's Fair movement.